True Paradigm: New Zealand not warming? It seems to residents that the country has not being getting warmer over the last decade. Such that advocates of global warming prefer the term climate change so that any weather anomaly can be attributed to anthropomorphic global warming. And people are willing to parrot claims that some parts of the world will get colder (this may be a prediction of the theory but should encourage one to cautiously consider these claims). Graph. Mean annual temperature over New Zealand, from 1853 to 2008 inclusive, based on between 2 (from 1853) and 7 (from 1908) long-term station records. The blue and red bars show annual differences from the 1971 - 2000 average, the solid black line is a smoothed time series, and the dotted line is the linear trend over 1909 to 2008 (0.92°C/100 years). 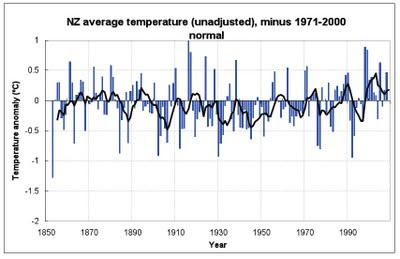 Yesterday the New Zealand Climate Science Coalition released an article challenging this rise using NIWA's own data. They plotted the temperatures from the NIWA source data and got this graph.